We have allium here, and it grows thick enough to scent the air, but I’ve never seen it form a blanket of color like this. Perhaps because here they grow under trees. I particularly like the second shot. I think of the first two pictures as artsy and the third more as documentary (though a pleasing document of what a colony looks like). 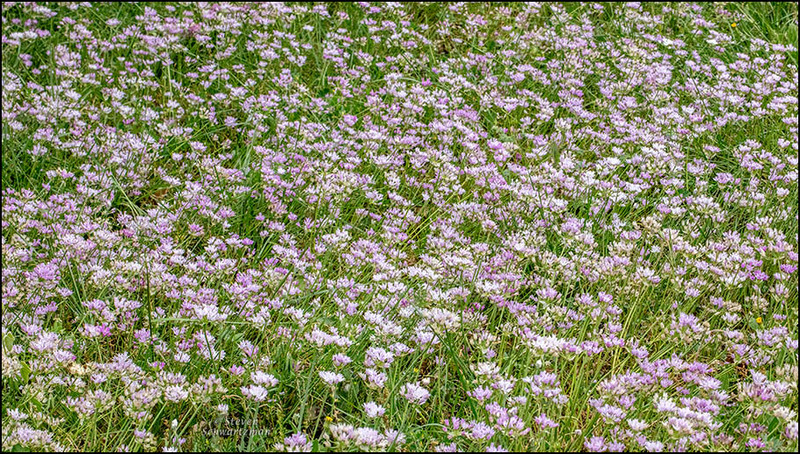 We have two species of Allium in Austin, and the other one can form groups but tends not to form such big colonies. Have I told you that the name Chicago comes from the native word for “stinking onion”? According to some sources, anyway. I don’t know if you mentioned that, but I came across it in some of the research I did when we visited your area. With terms that come from indigenous languages, it’s not unusual to have contradictory explanations. As for an avian portrait, don’t flicker away your time, get right on it. Yes sir! Currently I’m working on a painting of swallows swooping around over a pond. It was SUPPOSED to be abstract. I tried. I really did! Sounds like you couldn’t quite swallow an abstract approach. I’m going to keep trying. I hope you won’t find trying too trying. It is hard, but I want to do it because I’m bored with straight representational painting and I want to grow as an artist. I just need to try a bunch of approaches, make mistakes, and see. I’ve always enjoyed that translucent sheath, and you captured it well. ‘Packet’ is just the right word. I see these from time to time, but they’re always scattered, and however thick they may be, I’ve never seen colonies as dense as this. Now, I’m wondering if Austin provides an especially rich assortment of flowers because of the influence of Lady Bird and the Wildflower Center. Around here, I’m already watching the mowers wipe out colonies of primrose, Texas dandelion, and verbena from the medians and roadsides. 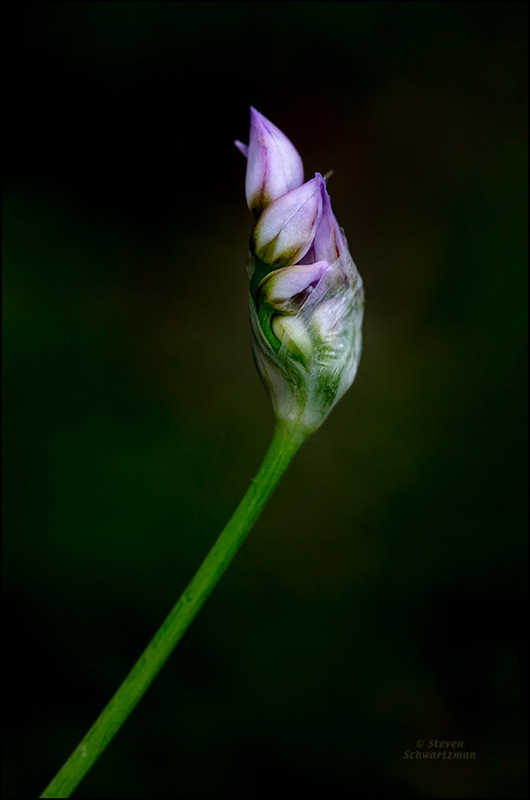 Sometimes I get the sense they hardly could contain their excitement if they saw something like this wild garlic. They could wipe that colony out in a flash. At the Lady Bird Johnson Wildflower Center the staff are good at removing nonnative species from the property. The Wildflower Center promotes the use of native species here and everywhere else. Nevertheless, it seems that for many mowers, in Austin as everywhere else, no power on earth can get them to stop cutting things that shouldn’t be cut down. Tomorrow I’ll report on a smart mower I recently encountered. I’ll bet your smart mower wasn’t powered by artificial intelligence, either. I did wonder, though, whether he had a smart phone in his pocket. We have a lot of wild garlic in the pecan orchard.I always thought it was a bit odd for it to flourish in the shade. It’s a pain to dig up and clean, but the delightful, tiny onions are a tasty delight. The flowering stage makes for a beautiful landscape and the scent is amazing as I drive along the UTV path in the orchard. Ours is ready to pick in May… so I’m patiently waiting. How nice that you get to enjoy those tiny onions. May is almost here. 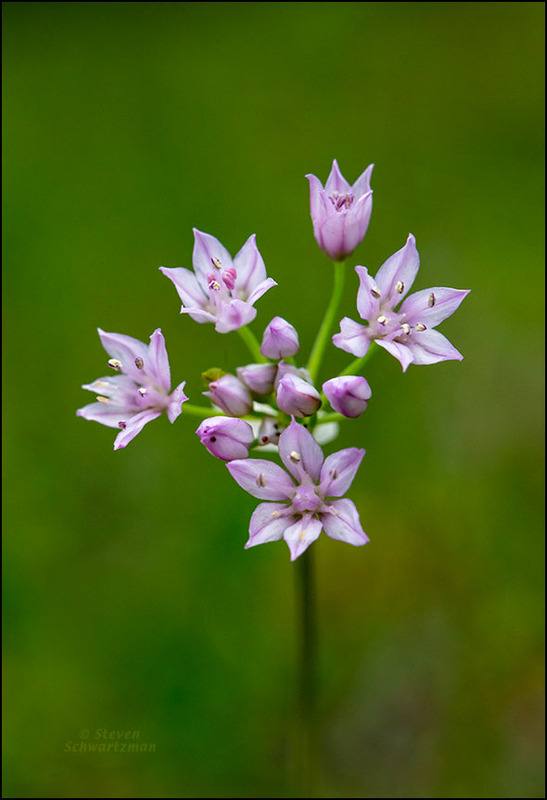 The terms “wild onion” and “wild garlic” have been used for various species of Allium. Do you know which one you have on your property? It’s a counterbalance to the other development that has reduced the habitat for this kind. Sweet little buds all wrapped up tight in cling film. Your wild garlic has a lovely lilac tinge, here ours are white (ransoms – Allium ursinum) with broad leaves. We also have three-cornered leeks (Allium triquetrum), wild onions, with strap-like leaves and stems that have three corners! “Cling film” is a good way to put it. I’m with you in finding one of this species’s endearing features to be its coloring, which varies quite a bit in tinge and pattern. This is the first I’ve heard of an onion with sedge-like leaves. The Wikipedia article on that species says the cross-section is concavely triangular. A great set of shots. It’s hard to pick a favorite, but that first one is glorious! Thanks. It’s the most abstract and simplest of the three, which could be two reasons it appeals to you (and me). All nice shots, artsy and not, but what about the 4th stage on your plate? I could say I already have a lot on my plate, so I haven’t tried collecting wild garlic and using it in my cuisine. Steve, These are wonderful images. I love that first unopened bud especially. Beautiful isolation of your subject with such nice color and clarity. And the progression of the three works so well. In that first picture it seems f/6.3 hit the sweet spot: good focus on the subject and no details in the background. I’d originally planned to show just that picture; after a while I added the second; finally I added the third to show the full range of this species. Obrigado. Quem teria pensado que o alho selvagem poderia ser tão bonito? You probably have wild onions too. I am told that they grow in riparian areas of most parts of North America. We have flowers that look like your wild garlic, but they are not even related. hmmmm. I can not remember the name. They grew in my driveway. Yours are prettier. Ours might be pretty too if I did not consider it to be a weed. I will be pulling some this year for pickling, but I do not expect good results. The only flavor will be provided by whatever spices get added. And I don’t have personal experience cooking with or pickling our local wild garlic—the opposite of my experience photographing it over the past two decades. Wonderful stuff! This post has reminded me that I need to buy more for planting! I’m glad to see such enthusiasm. Plant away!